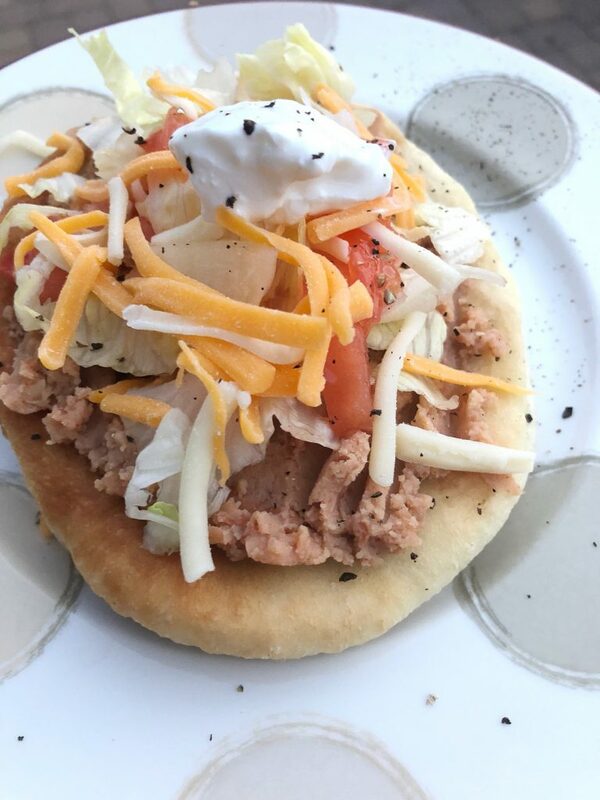 Easy Indian Fry Bread - Made It. Ate It. Loved It. Looking for an easy indian fry bread recipe? These delicious little gems have a few names. Fry bread, navajo tacos, elephant ears, etc. But whatever you call them they are absolutely delicious! I have found a shortcut to make these even more easy to enjoy! And thanks to Rhodes Rolls all you have to do is let them thaw out and rise and then you are almost ready to go! Here is an easy 2 ingredient fry bread recipe. Heat up about 3 inches deep of vegetable oil. Then flatted out some of the rolls and one by one fry them up. Cook them until lightly brown on each side and then flip with tongs and do the same thing on the other side. Remove and place on a plate to cool for a little before topping them. For dinner you can top them with beans, lettuce tomatoes, sour cream, cheese, etc. For dessert we like to top ours with powdered sugar and honey.